Thanks to Dr. Sean Williamson, Indiana University School of Medicine, for contributing this case. To contribute a Case of the Week, follow the guidelines on our Case of the Week page. Spend less time, getting better information to make REAL changes while always being compliant. (1) The Ovary-nontumor chapter has now been updated, based on reviews by Mohiedean Ghofrani, M.D. and Shahidul Islam, M.D. (3) The Colon tumor chapter has now been updated, based on reviews by Jela Bandovic, M.D., Shilpa Jain, M.D. and Charanjeet Singh, M.D. A 39 year old man had surgery for an intracranial tumor. 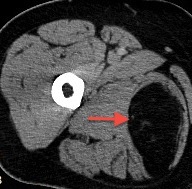 PET/CT imaging incidentally revealed an 8.9 cm fat-density soft tissue lesion within the right adductor magnus muscle. PET demonstrated evidence of increased metabolism within the mass (SUV 3.1), raising a differential diagnosis of benign intramuscular lipoma and liposarcoma. 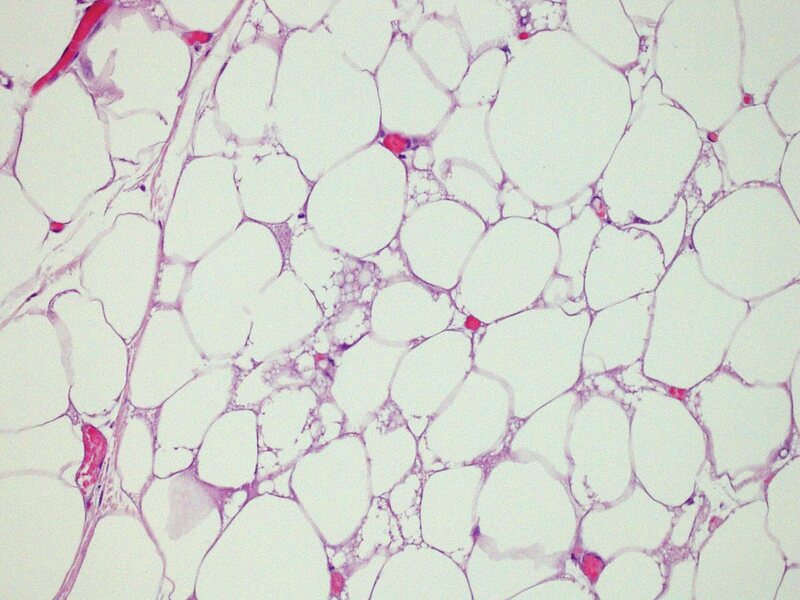 Hibernoma is a lipoma subtype containing prominent brown adipocytes that resembles normal brown fat, as a classic lipoma resembles white fat. It is rare, representing 2% of lipomas; 60% occur in males, and the mean age is 26-38 years. Hibernomas occur most commonly in the thigh (as in this case), shoulder, back, neck, axilla and mediastinum (Am J Surg Pathol 2001;25:809). Thigh lesions may mimic liposarcoma by CT/MRI (Med Sci Monit 2009;15:CS117). Grossly, hibernomas have a red/brown cut surface resembling the brown fat in some hibernating animals. The brown color is due to vasculature or mitochondria. These tumors are soft, lobulated, well delineated or encapsulated. 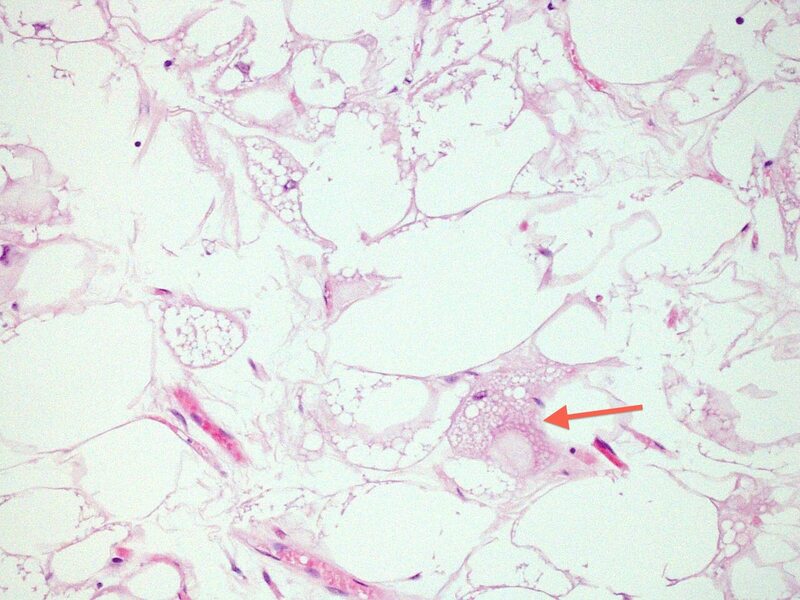 In 10% of cases, they infiltrate adjacent striated muscle. Histologically, there is an organoid arrangement of uniform large cells resembling brown fat with coarsely granular to multivacuolated cytoplasm that is eosinophilic or pale. Vacuoles are small and stain for neutral fat. 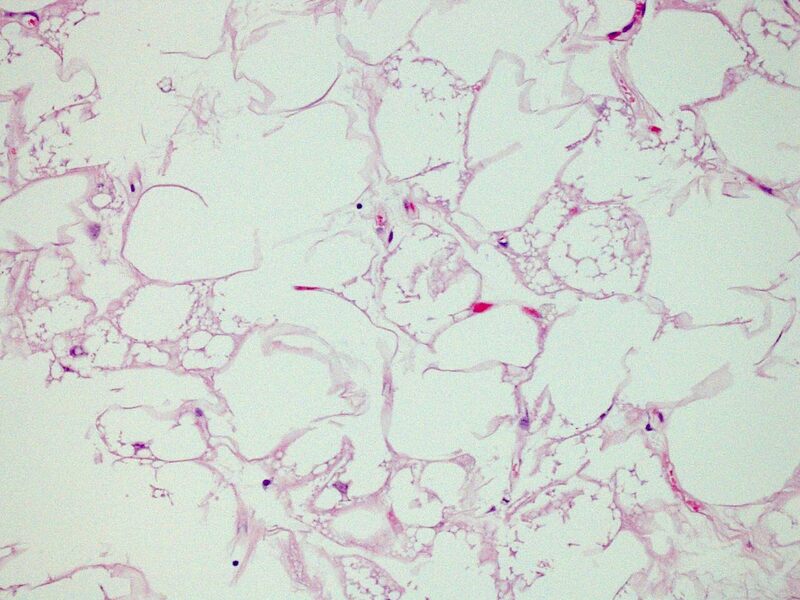 The nuclei are small and central, with no/rare atypia. They often contain mixtures of white fat, as well as loose basophilic matrix. Subtypes include lipoma-like, myxoid and spindle cell. 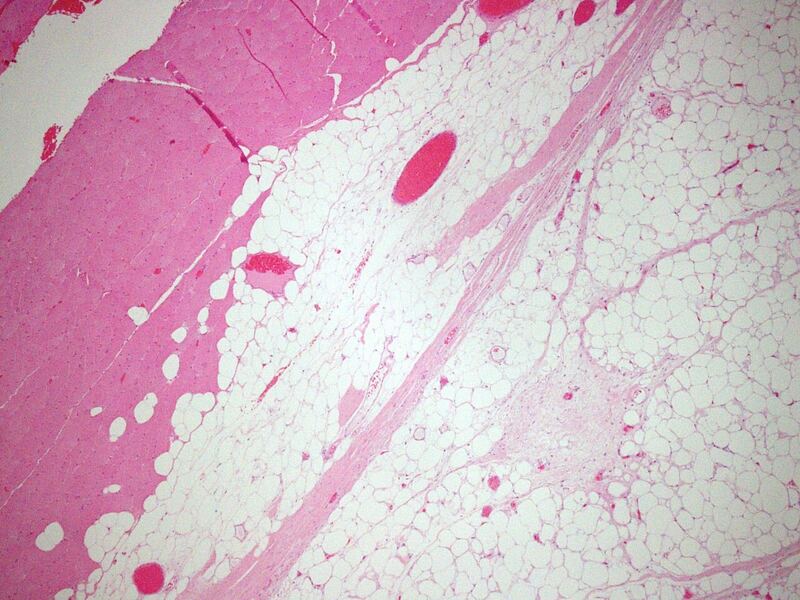 The differential diagnosis includes atypical lipomatous tumor, lipoma and normal brown fat. Atypical lipomatous tumor / well differentiated liposarcoma is a deep tumor with atypical cells that are positive for MDM2 and CDK4 by FISH or real time PCR. In classic lipoma, the lipocytes are not multivacuolated. 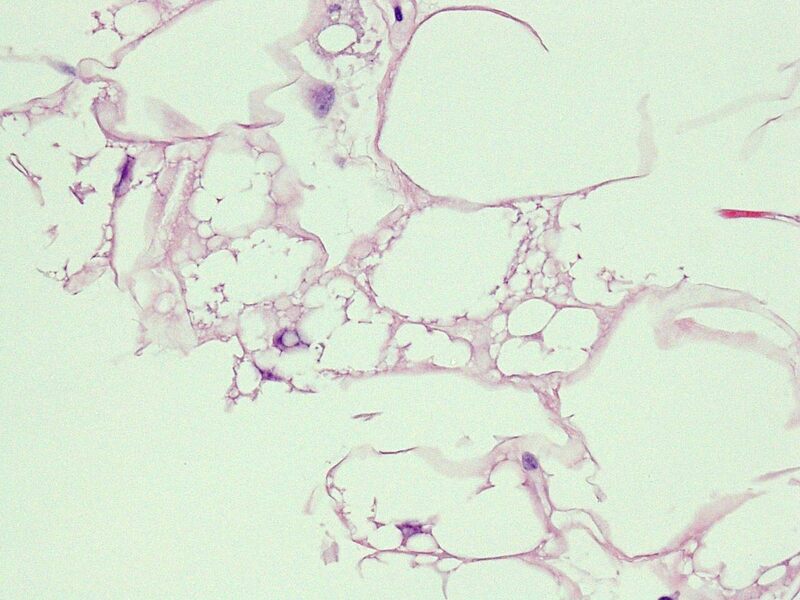 Children may have residual brown fat around cervical or axillary lymph nodes, but it does not form a distinct mass. 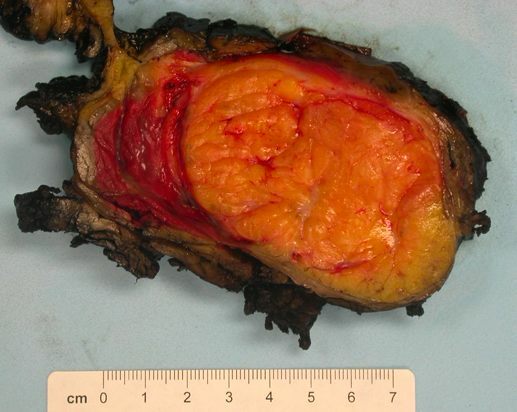 In this case, the tumor was predominantly lipoma-like, with only rare multivacuolated cells and rare cells with a more eosinophilic appearance. No large hyperchromatic cells specific for atypical lipomatous tumor / well differentiated liposarcoma were identified. Complete surgical excision is associated with an excellent long term clinical outcome.